My neighbor has piles of bamboo in her east facing garage which unintentionally has become the biggest mason bee nest for miles I’m sure. I noticed a couple years ago that the swarm in her garage was filling the bamboo with their nests and advised she leave the door open. She has been more than happy to every year since. No special nests or anything, just a serendipitous placement of poles and viola! Mason bees! Thanks for saying something on this subject. It’s important. That’s so interesting, and what an entrancing image! It tempts me to make a pile of bamboo poles, but unfortunately I lack the bamboo. For me, the famously invasive Phyllostachys dulcis is less than three feet high and struggling hard. 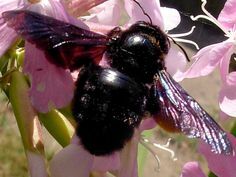 Come to think of it, I don’t even know if we have mason bees around here. There’s something to study.